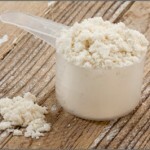 Get the blandness out of your whey, and start making your whey meals more interesting! Proteins are the essential building blocks of muscles in your body. If you lift weights, then you’re no doubt familiar with whey protein supplements. This article isn’t about the science behind the different proteins. This article is going to focus on those who are sick and bored of the same ol’ protein shakes, day in and day out. Protein doesn’t have to be consumed solely in a shaker cup, post-workout. Don’t get me wrong, protein should ALWAYS be consumed post workout (specifically whey). But we want to add some variety to that sometimes chalky protein powder. Milk – mix some protein with milk (whole, skim, whatever) and give the shake some extra flavor and body. Fruit – put some protein in a blender, add some berries, a banana, whatever fruits you like, and blend it up and drink yourself a delicious fruit smoothie, with protein included! Why pay $6 or more for a fruit protein shake at the gym when you can have it for a fraction of the cost? Peanut butter – ever drink a chocolate flavored protein shake with peanut butter? No? You are missing out on some amazing flavors. Put some natural peanut butter, or almond butter, or whatever natural nut butter you like into your whey, mix it up good, and enjoy a taste of heaven. Cereal – While I am not too keen on breakfast cereals (talking about the supermarket brands), there are certain ones that are OK to eat, in moderation (for example, the Kashi brand). If you’re going to be eating cereal anyway, add a scoop of some flavored protein powder, and make that bowl of cereal a lot more nutritious. Pancakes – How you do this is up to you. What I do is, I put some whey in a bowl, add water or milk, add some cocoa powder and cinnamon, maybe an egg or two, mix it up so the mixture is kind of lumpy, and then pour it onto a skillet and cook it evenly timed on both sides, and you have yourself some very delicious nutritious pancakes. Yogurt – Pretty simple here. Get your yogurt, add protein to it, mix it up, eat it. Cottage cheese – same concept as the yogurt. Maybe it’s just personal preference, but I always add half a packet of All Natural Stevia in there too, just for the added sweetness. Ice cream – What I do is I melt the ice cream a little bit so it’s kind of gooey, I add some protein, mix it up real good, and put it back in the freezer until I am ready to eat it. The amount of protein you want to add will depend on the amount of ice cream. Don’t go nuts with this, since it’s still ice cream and it’s not the greatest food while dieting. Alternatively, you can make your protein ice cream. There are tons of different recipes and ways to go about it. Sugar free Jell-O – Get your sugar free jello mix ready for preparation, and add protein before preparing it. Simple! There is no need to be boring and bland with your protein. Everything gets old when repeated enough times. There are a lot more foods and ideas you can come up with to spice up your protein powder routine. These are just a few. Switch it up and if you come up with some new and interesting ideas – don’t forget to share them with us! Enjoy! 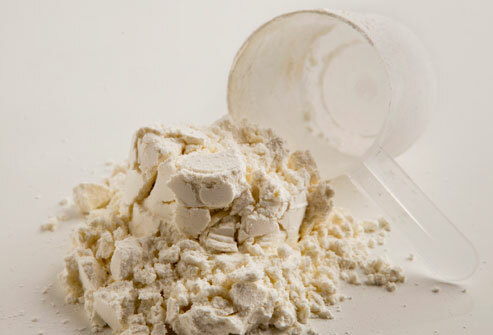 Maybe it would be a good idea to try out some of the best tasting powders out there. Myofusion tastes nice, but the most deliciouson product is Syntha 6 – jsut give the coohocalte peanut butter a try. this is the only powder that doesn’t taste synthetic – but not the ebst one when it comes to building muscle. In that case my favorite is ON Gold Standard. Protein powder recipes are awesome! I make lots of different stuff using protein powder as a substitute for flour. Sometimes both though. These recipes are awesome and a great way to change up the monotony of drinking shakes day in and day out. Good article guys!